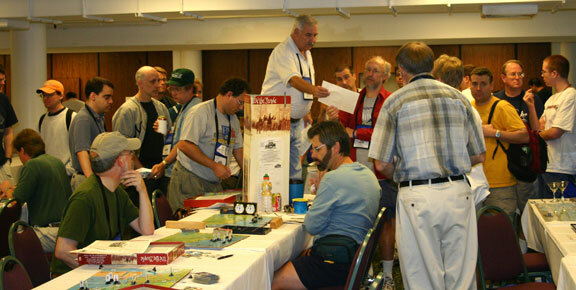 I officially declare the WTP tournament at the 2005 WBC a huge success. We had 43 players including five who participated in the coached bracket. We crowned a new champion! Chris Byrd arose, phoenix-like, to strike down previous champion George Young's Washington in a delightful Final. There is absolutely no question that fatigue and endurance play a tremendous role in the WBC championships. This was demonstrated in every one of the Card Driven Game (CDG) tournaments, but only in the WNW Final was the effect as striking as here. Despite giving up a 3 PC bid to the British, George Young's Americans had stymied every effort by the Crown to establish a viable foothold in the colonies. As the game reached its final cards, the British were largely penned into the coastal regions of New York, Delaware, Pennsylvania and New Jersey. To prevent a last minute sortie by British forces to steal a colony or two, George wisely determined to send Washington into a position to block some exits. He noticed one force that could reach the spaces behind Washington, but due to fatigue miscounted the distance of another. Thus the possibility of the British holding a Major Campaign was considered, but then mistakenly discounted. Resting in Chris' hand was the crucial Major Campaign that he needed, so he moved his Armies to cut off Washington's retreat. At this point, Mars intervened. Washington failed both an intercept attempt and lost the subsequent battle, either of which would have saved him. Chris was rewarded for keeping his forces in a position flexible enough to take the chance. George saw a superbly played game buffeted by the winds of chance due to a single fatigue driven error that likely would have gone unnoticed by a lesser player. Both gentlemen acquitted themselves and our tournament superbly. It is interesting to note that George had a loss during the Swiss portion of the tournament and that Chris had two draws. Both were required to play in the 4th Swiss round rather than be offered a bye. In fact, no player in the tournament advanced to the Quarterfinals with an unblemished record; all had at least one drawn game. When Keith Wixson (unfortunately for all) had to drop out to participate in a different event, your faithful GM was forced to rely upon a die roll to determine the tie breaker between Brian Montford and Bruce Wigdor. 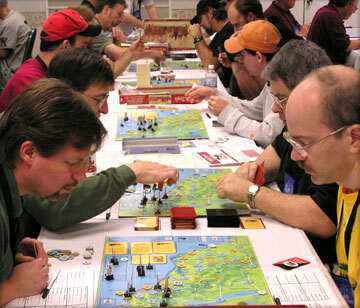 The resulting Quarterfinalists were: Marvin Birnbaum, Chris Byrd, Jim Eliason, John Faella, Paul Gaberson, George Young, Rob Taylor and Bruce Wigdor. Defending Champ John Poniske didn't make it out of the Swiss rounds - one of Chris Byrd's earlier victims. Five rookies participated in a total of nine games in the coached bracket which was a pure Swiss sub-tournament. None of the participants were true tyros, but all felt that they could not keep up the pace in the general tournament. This was an accurate assessment as their games averaged about an hour longer in length. With this format, there was no interference with the main tournament, so I remain convinced that WTP, as the easiest CDG to cut one's teeth on, will remain a coached event to help generate new blood for the genre. In this division, Frank Mestre was undefeated and so receives the Minuteman Militia Award, a copy of David McCullough's 1776. The Von Steuben Award goes to Ron Fedin for superlative support to the Coached Tournament. He passed up his chance to participate in the WTP tournament to provide coaching, rules and tactical advice and serve as a sparring partner in the coached bracket. Due to his training, next year these participants will be able to play in the primary tournament without having to give up a "Regulars Advantage". This year I determined to give a name to our Sportsman Award. It will be known as the John Paul Jones Sportsman Award. Captain Jones, as every school child knows, was a high spirited warrior who was relentless in his pursuit of victory. What is less well known is that he fought all of his engagements with a strict adherence to the rules and customs of the day. He was determined to acquit himself not only as the victor but to bring honor to the Continental Navy and on himself. For example, when he raided Whitehaven and St. Mary's Island, his crew took as a Prize the family silver of the Earl of Selkirk. While a legitimate prize, and its taking caused considerable consternation to British nobility and uproar in Parliament, which was his military objective, Jones' personal sense of honor was such that "war should not be made upon the Fair". So at the condemnation hearings of the Prize court, Captain Jones purchased the silver with his private funds and had it returned to the Lady Selkirk. As in the past, we are looking for nominees who can manage to walk that fine line between competitiveness and a strict sense of personal honor. The John Paul Jones Sportsman Award, a copy of David Hackett Fischer's Washington's Crossing, was presented to Marvin Birnbaum. To say the least, Marvin is at least as demonstratively emotional in competition as Jones Paul Jones had to have been, and ironically this year was as upset as I've ever seen him as the fates conspired to chip away a winning position in the quarterfinals. But having played with and against him many times over the years and in different games, I've come to realize that he can be relied upon to act with a great sense of personal honor, to play by the rules - even correcting mistakes made to his advantage, to help novices by pointing out potential blunders, and generally to act such that everyone can enjoy the gaming experience. It is true that with his enthusiasm and demonstrativeness he is not as diplomatic, tactful or subdued as our more recent nominees, but that does not make him any less a sportsman. Marvin's personality may grate on some, but I think recognition is due to all who compete hard - with enthusiasm as well as their sense of honor. So this year, I choose to recognize the integrity of one of the many who play with a different, more boisterous but nonetheless honorable style. My thanks go out to all who participated. You make being a GM easy and enjoyable. I truly appreciate getting to see y'all each year and renewing our friendships. My congratulations go out to our many winners, but even more to all who had a good time participating in their hard fought duels.